Destroying your hair through heat, colouring, repetitive styling, hard water and harsh hair care products in something many of us do, I tend to dye my hair until it wants to disconnect itself from my scalp. Coconut oil totes many wonderful claims for its absorbency and repair qualities. I don't know if all the things that are said about it are true, what I do know is...it is cheap and leaves my damaged hair softer and has brought it back from the brink of disaster more than once. An Overnight Treatment, by coating my slightly damp hair in it and wrapping it in a towel and putting a towel over my pillow. I then wash it out in the AM and am left with great hair. A Pre-Poo Treatment, by rubbing some of them into my hair 10 minutes before washing my hair. A Hair Mask, by putting it in my hair in the shower, leaving it a few minutes then washing it out and conditioning as normal (similar to the pre-poo). It melts in your hands so super easy to put in your hair. Now if you question my comment on it being cheap, I am using cooking coconut oil. It is cheaper and heck I am putting it in my hair. 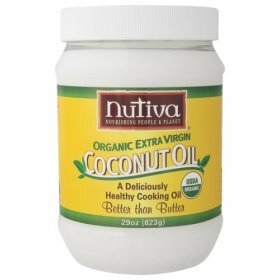 I got my tub for $7.99 (29 oz made by Nutiva, I got it at Homesense) and it has lasted me months (months people) and I have still have of it left.